Lark-Wi is a smart lock, but first it has to be a trustworthy household lock made with industrial grade steel, just like the keypad locks that you can buy at Home Depot or Lowe'S. That's exactly the point : Lark-Wi smart lock has to be a good solid lock that conforms to the ANSI standard, and passes rigorous mechanical tests to guarantee 10+ years of life, so that our users can entrust their home's safety and security to Lark-Wi. Your smartphone is now a smart key and more. Lock and unlock your door, create virtual keys for guests, and keep track of who comes and goes, all from your iOS or Android smartphone. No more fumbling for keys. 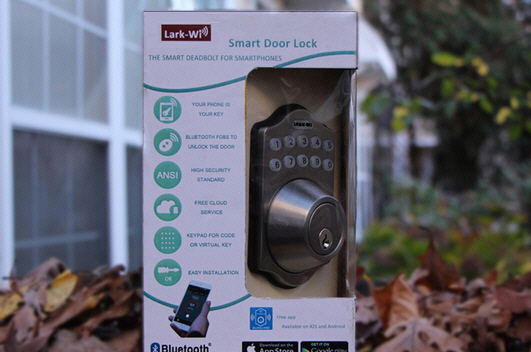 Lark-Wi Smart Lock auto-locks behind you for peace of mind as you approach. Turn on or off whenever you want. activity log tracks who enters and exits your home. And with unique keys for each user, you'll always know who opens your door and when. Grandma visiting? Babysitter? Carpet cleaning? No problem! Send a temporary key code to your guests with a set expiration window, guests to unlock Lark-Wi no need for a smart phone or traditional key! 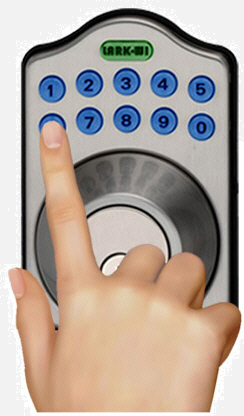 You will know exactly when the key code is used and your door accessed. You can set up permanent ones for your family too. You can optionally get a smart Wi-Fi gateway, which uses Wi-Fi to connect to your phone and Bluetooth to connect to the Lark-Wi. The Lark-Wi-GP Smart Wi-Fi enabled smart switch connects your home appliances and electronic devices to your Wi-Fi network, allowing you to turn devices on or off, program customized notifications and change device status - from anywhere. You can be separately controlled by your phone or through the Cloud and Lock and unlock your Lark-Wi Smart Lock from anywhere, right from your smartphone.